Not only is the name fun to say, but this little contraption makes for some easy and delicious sammies. It’s not the same kind of passion that I have for my juicer, and doesn’t hold a candle to my coffee-maker love… but it sure does make me happy. 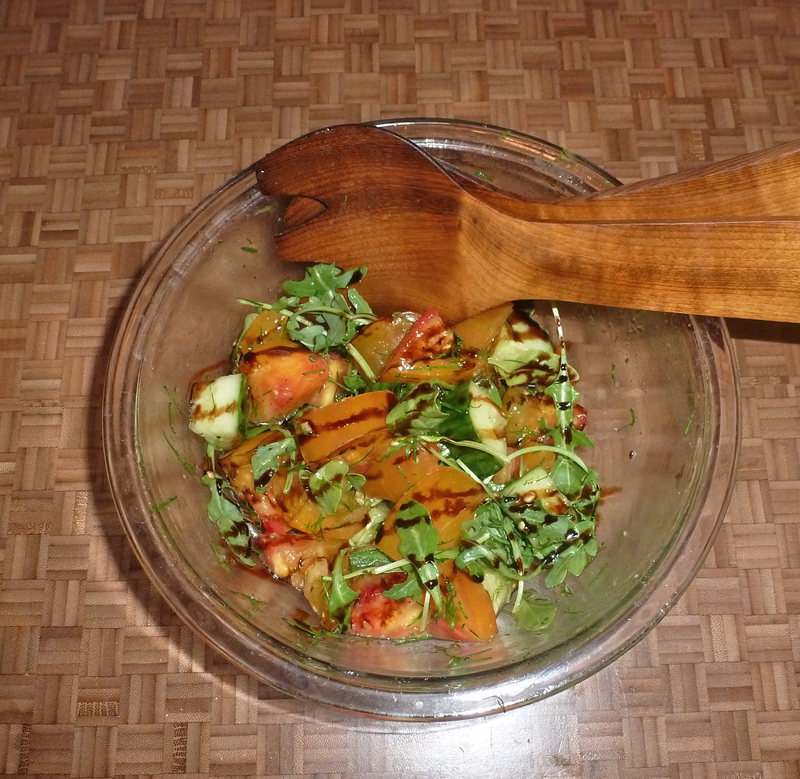 I picked up the best of summer produce for this meal, and wanted to keep it fresh and simple. 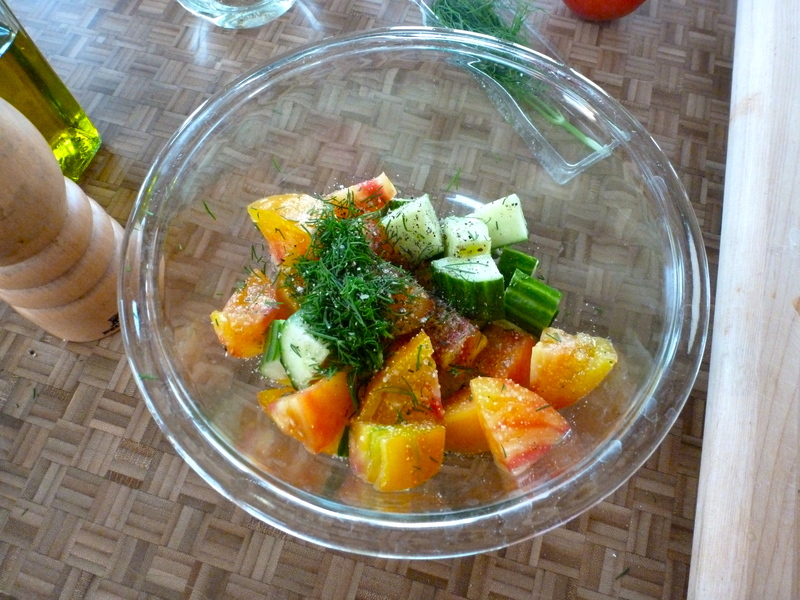 A gorgeous orange stripey tomato, English cucumber, fresh dill and a teensy bit of baby arugula would become a tasty salad. 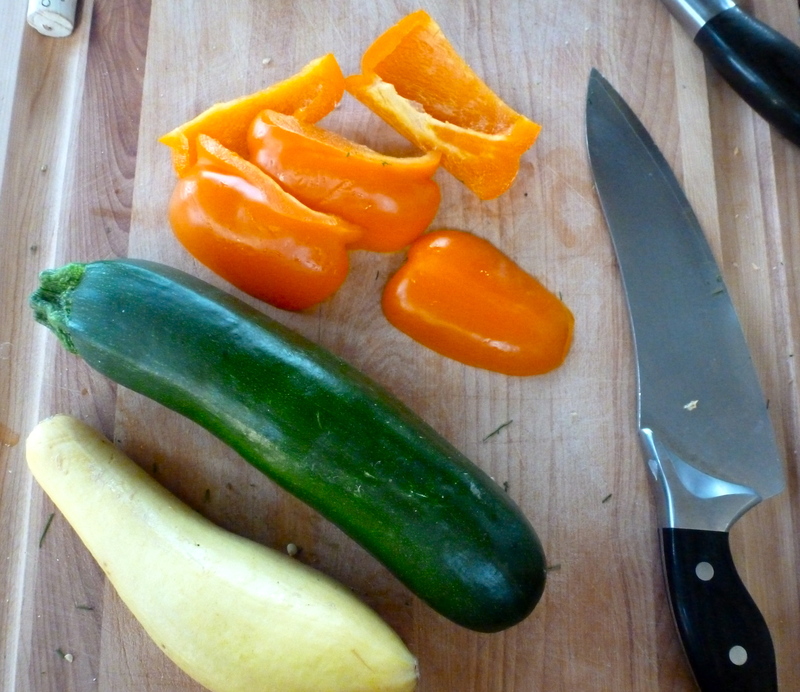 For the paninis, I started with zucchini, squash, sliced jalapeno and an orange bell pepper. 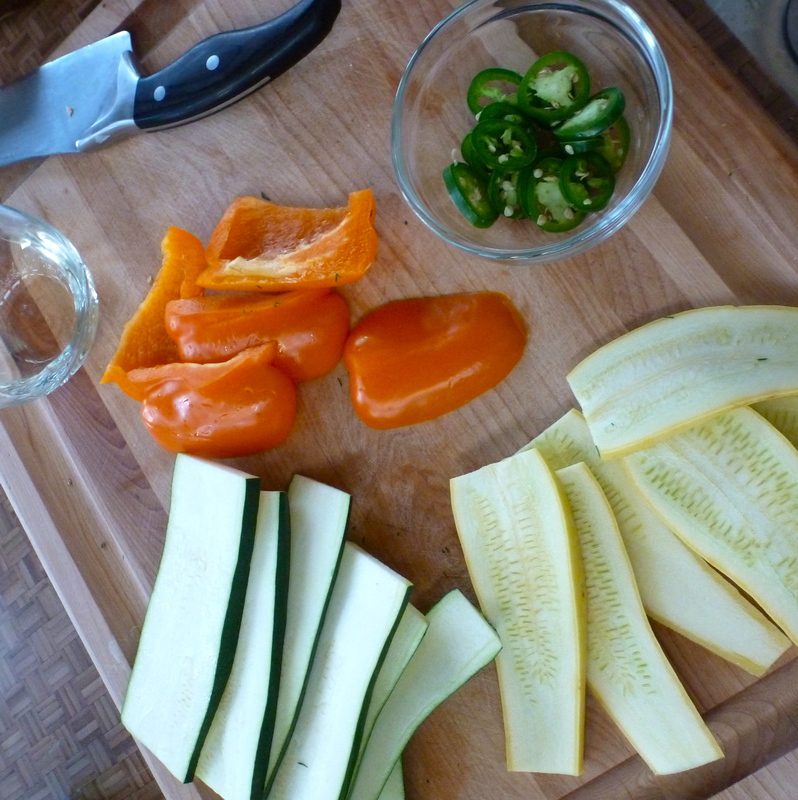 I love the veggie rainbow on the cutting board! 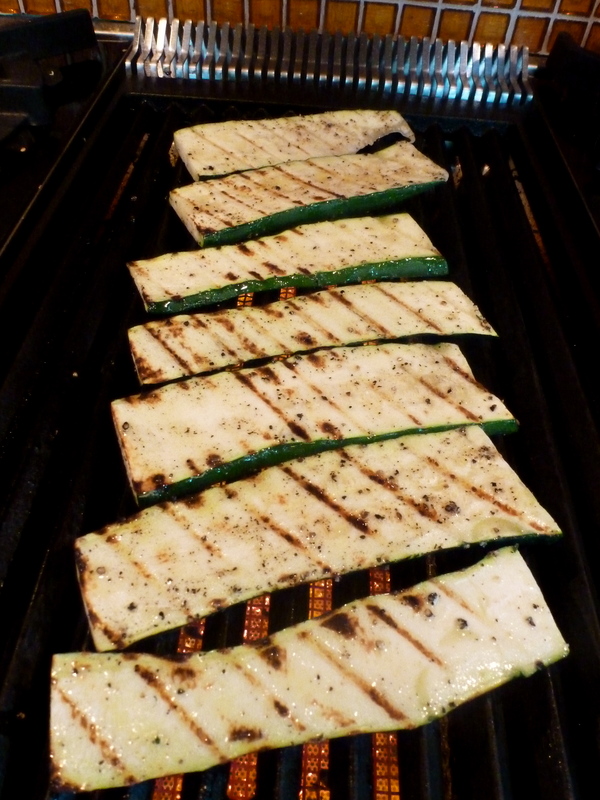 I fired up the indoor grill and drizzled a little olive oil over the veggies, giving them a basic seasoning of garlic salt and fresh cracked pepper. 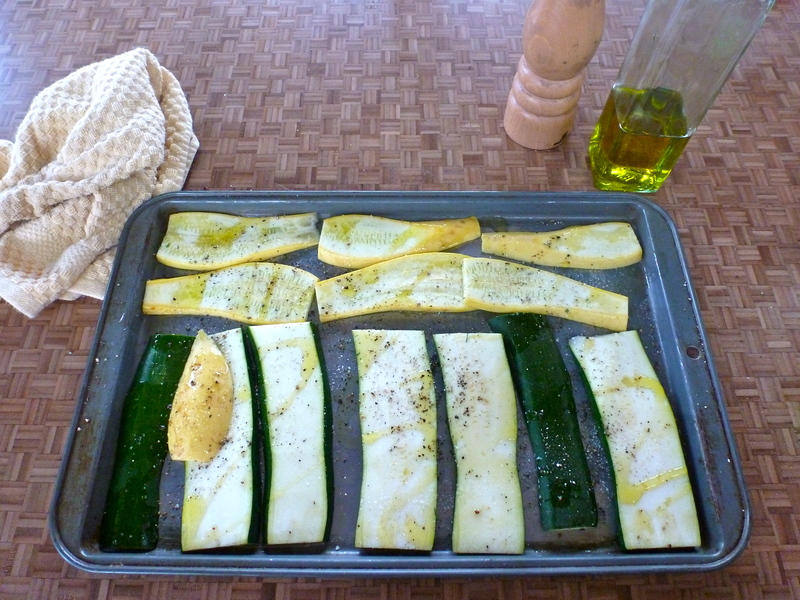 To the grill! John gets a little nervous when I spend time at the grill. 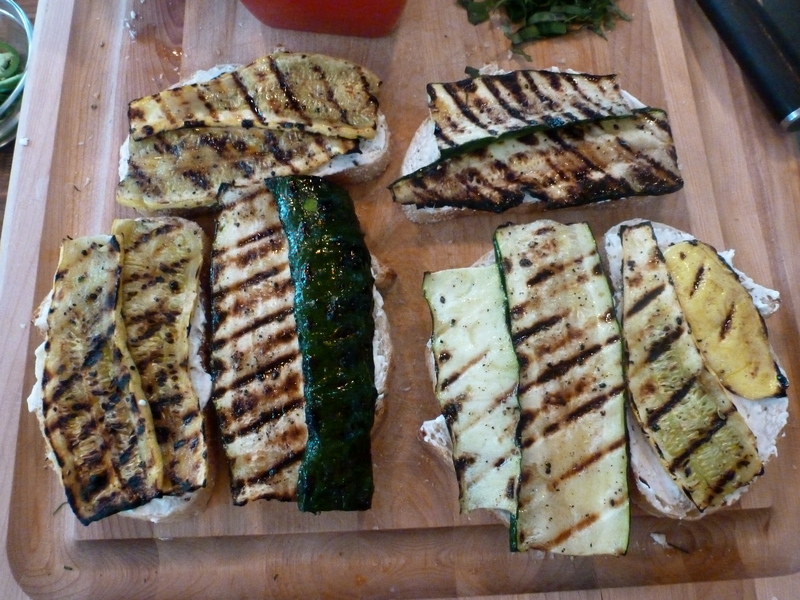 After my success with grilling swordfish, I feel more comfortable using the grill. I reassured him that it’s still his domain and set up my sammie-building assembly line. 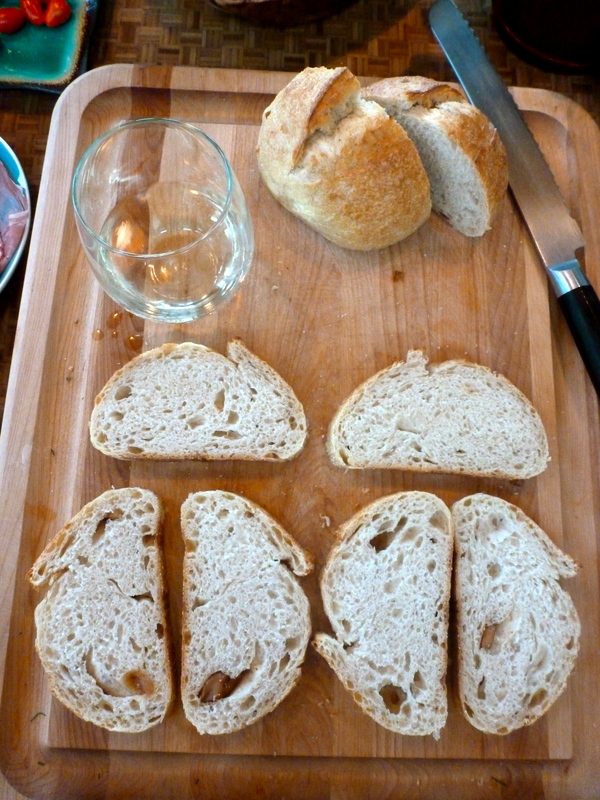 I sliced up some roasted garlic bread (oh, yeah!) 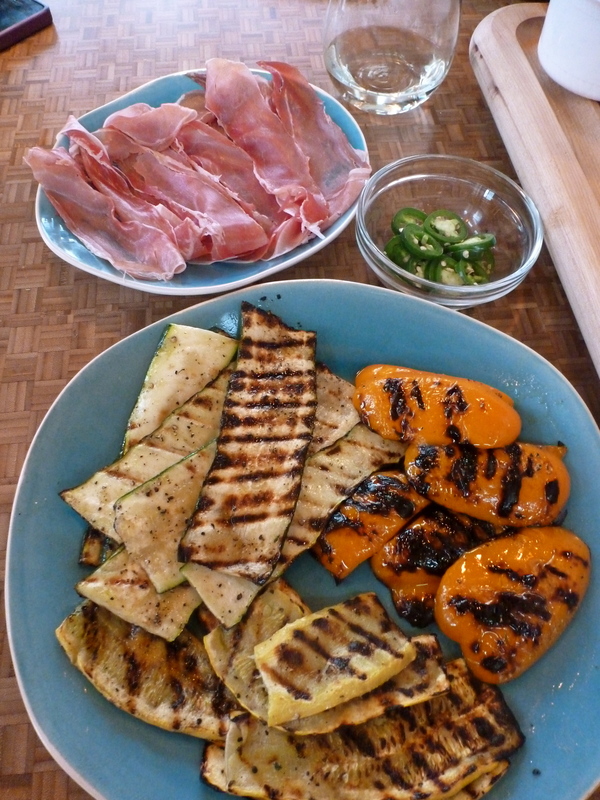 and set out my grilled veggies, jalapenos, some prosciutto, garlic and herb spreadable cheese, and mozzarella. I’m a big fan of the assembly line in the kitchen. 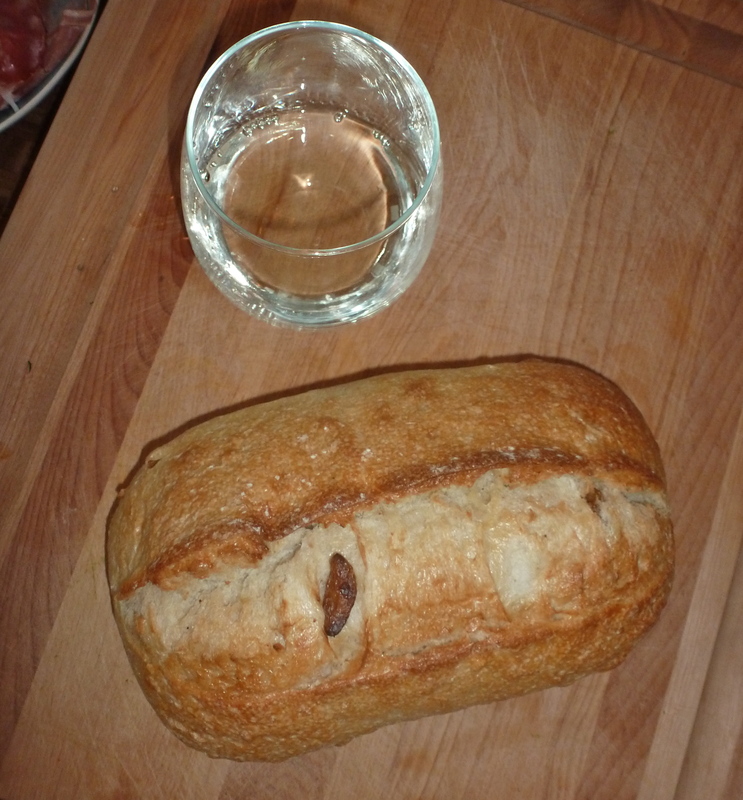 Having everything accessible makes it easy to create deliciousness. Here’s how it went down. 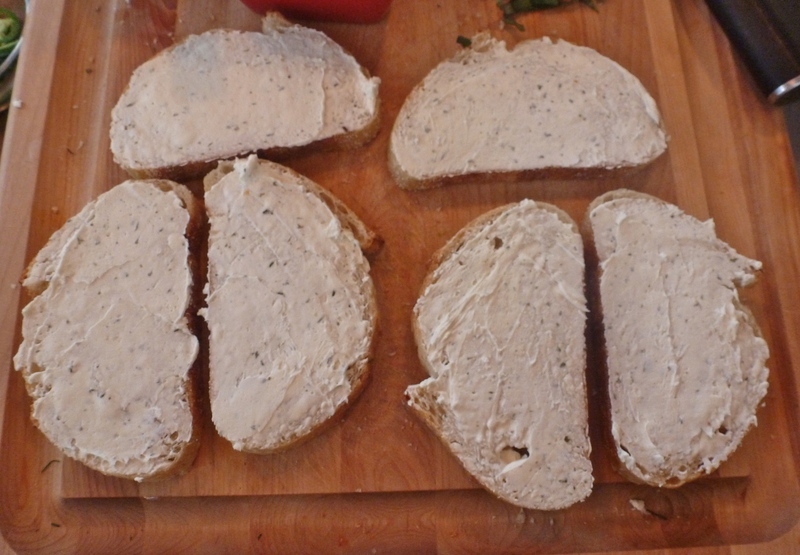 For each sandwich, I spread both pieces of bread with the garlic and herb goodness. 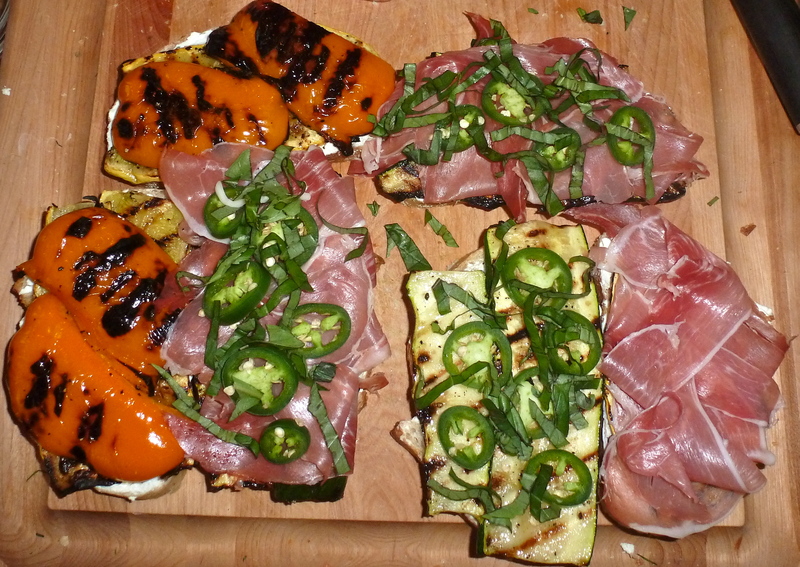 Then came the veggies, then the meat, then the jalapenos and some fresh basil. 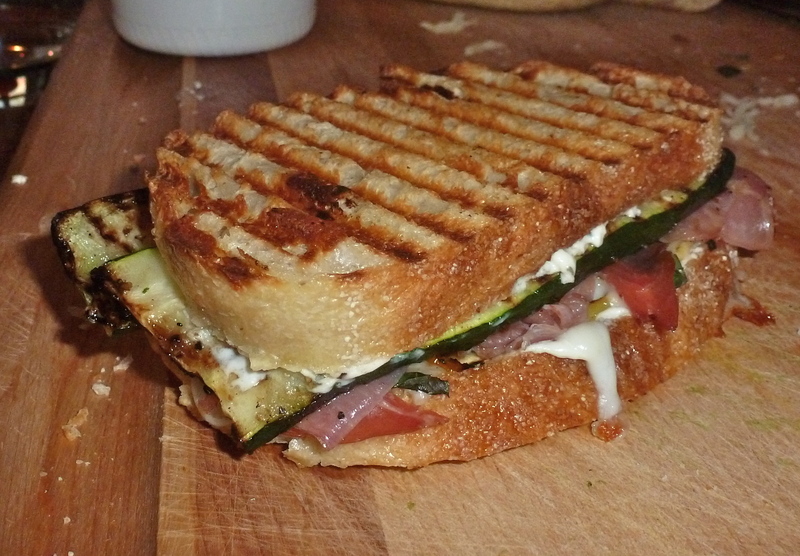 The key to these perfect paninis, I suspected, would be a layer of mozzarella in the MIDDLE. 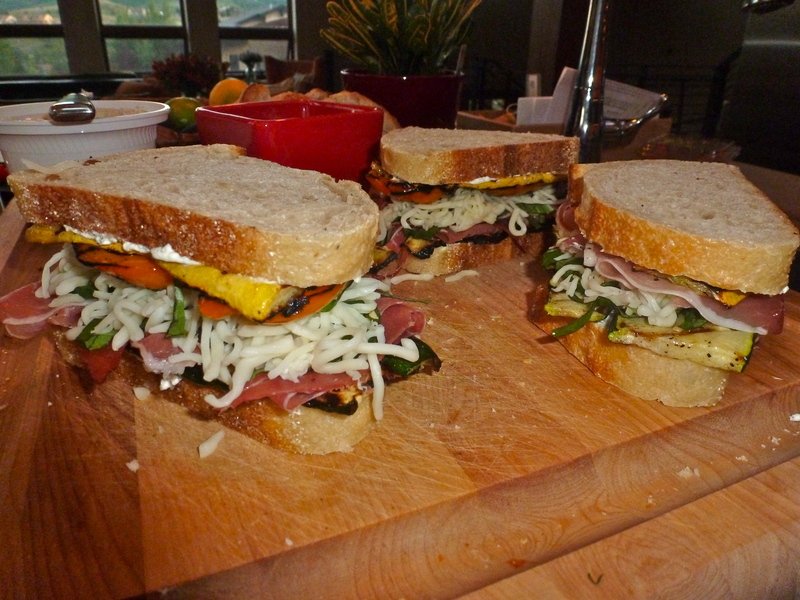 The melted cheese would keep the veggies from slipping off of each other and help keep the sandwich together. Genius. 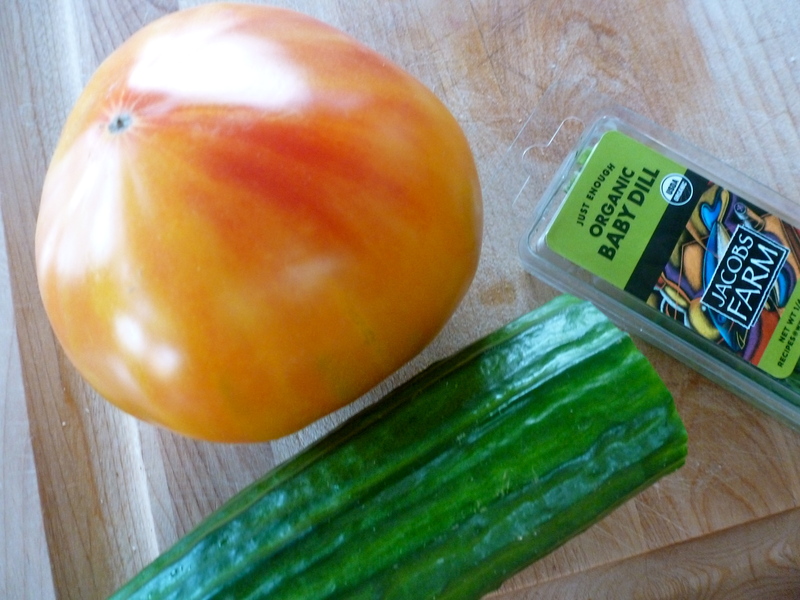 I know what you’re thinking…There’s no WAY that tower of veggies and bread is going to hold up without falling apart. That’s the magic of the panini! It smooshes all of the stuff inside together into a melty, grilled sandwich. I know you want a bite. 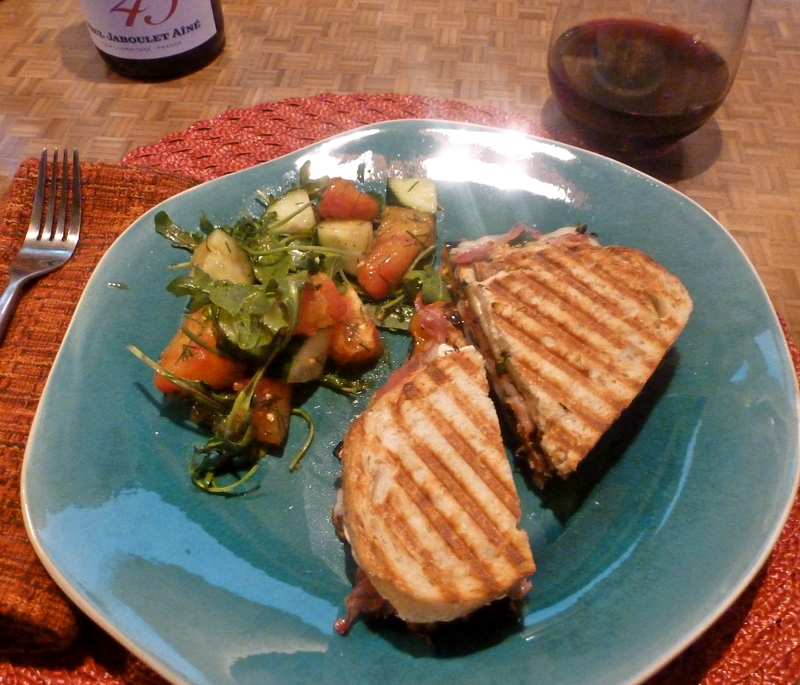 The paninis turned out to be completely delicious. The bread crunched with each bite, and the veggies were full of texture, with a little bit of charred goodness. 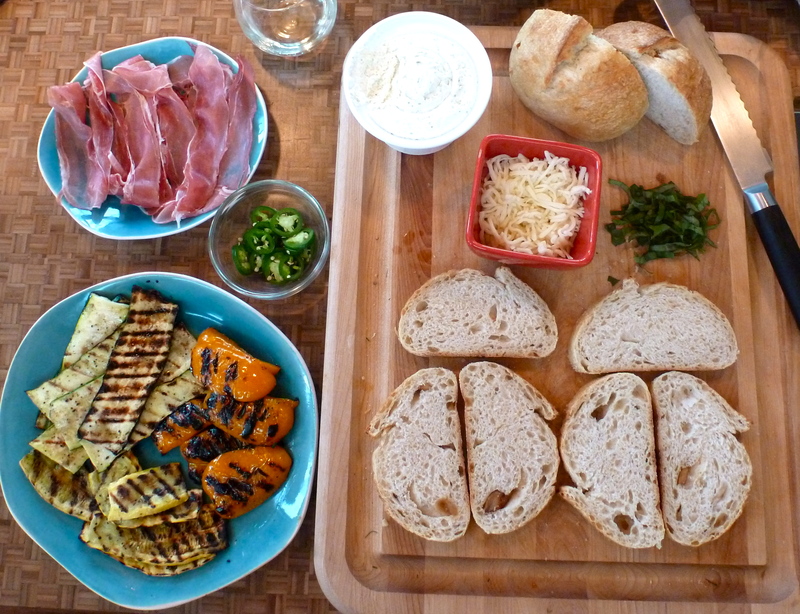 That garlic and herb cheese was an awesome addition, and my mozzarella-in-the-middle idea? Totally worked! 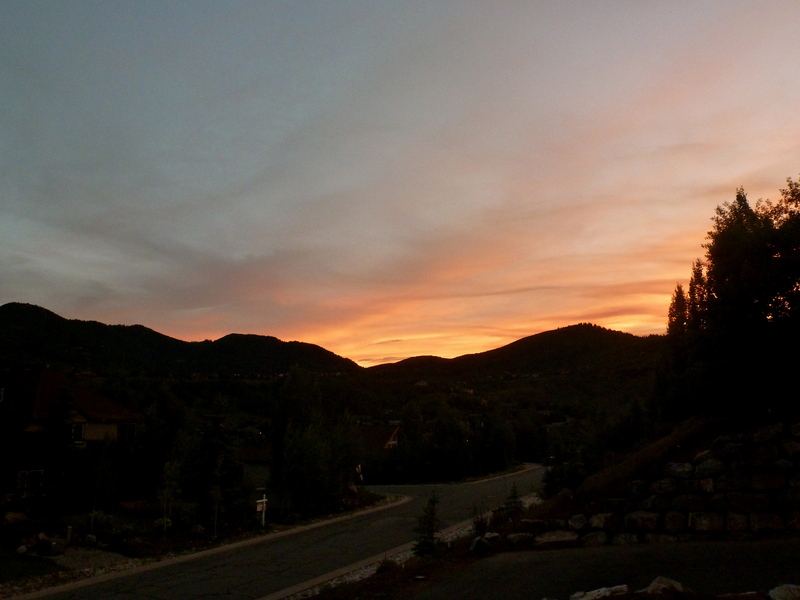 Our plates were filled with the flavors of summertime, and a lovely sunset was our dessert. Just kidding. That was a lie. S’mores ice cream was dessert. Previous postA tourist at home. Wow. Yes, I want a bite. 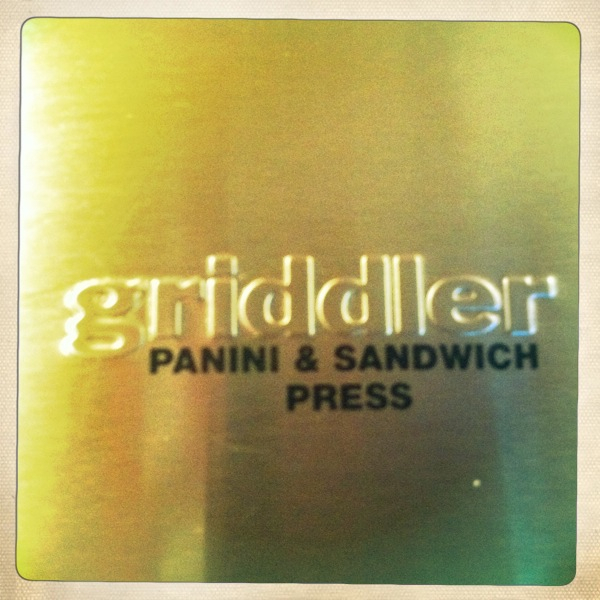 A Griddler has just been added to my Want list! Yum! I love paninis! 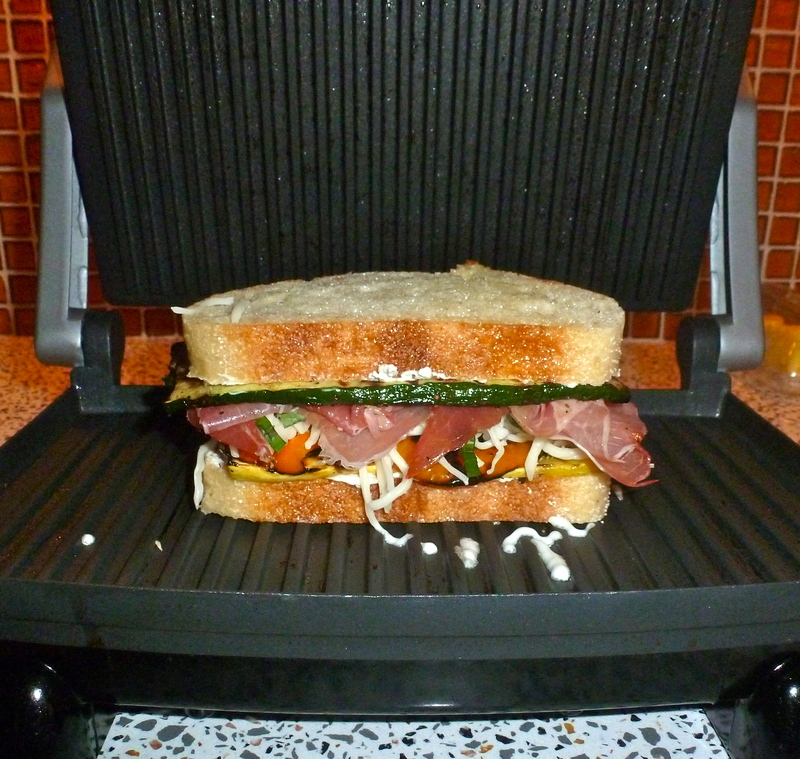 And, I couldn’t live without my panini press… it’s a hard worker in my kitchen! I want to make some kind of grilled dessert! I haven’t tried that yet, we normally just put stuff outside on the grill for that. 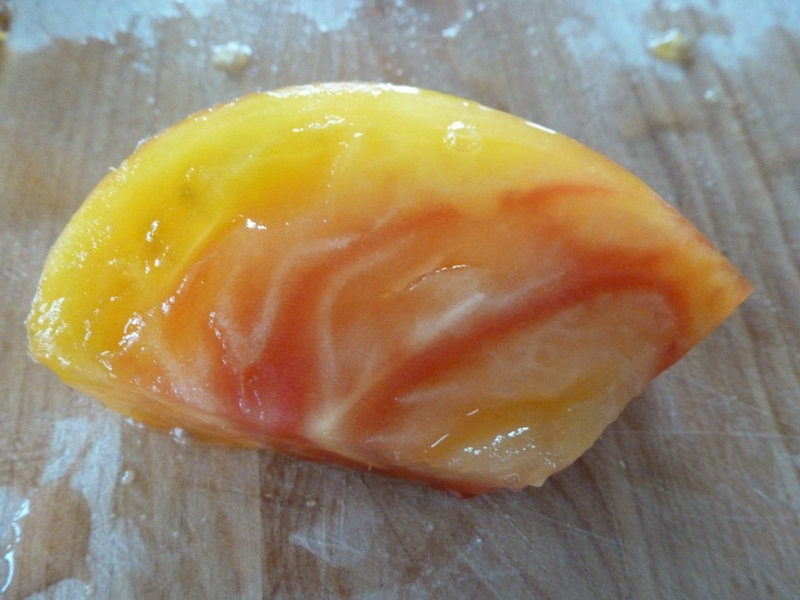 But, I guess I could try pineapple slices or cut peaches on the press… wouldn’t be as smoky though. 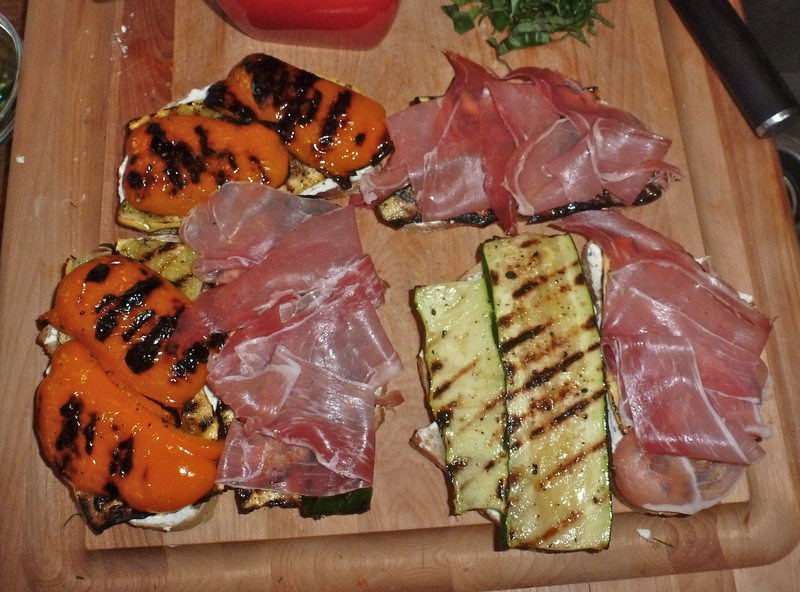 I love grilled peaches! Mmm. I was thinking more like a Nutella sandwich or grilled donut. Hmm. When we are over run with apples I slice them thin and put them on bread with nutella and peanut butter and heat that in the press… it’s my go to lunch/dessert panini in the fall. But, if you make a grill donut and take a picture of it I just might eat my laptop. Oh, ya! 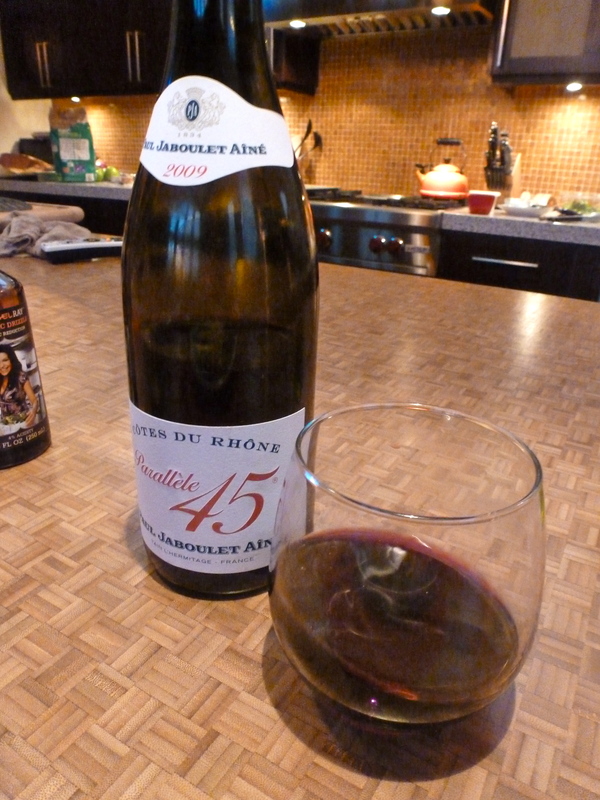 The butter makes it even better…! The sandwiches look mouth-watering! You should totally do a dessert sandwich… with Nutella. And maybe brioche. Just saying. And maybe also bananas. And marshmallows. And peanut butter. I’m not a J fan! No jelly for me but the PB part sounds delish!!! I’ve never been hungrier EVER. Thanks. 🙂 Nice! This all looks delicious! 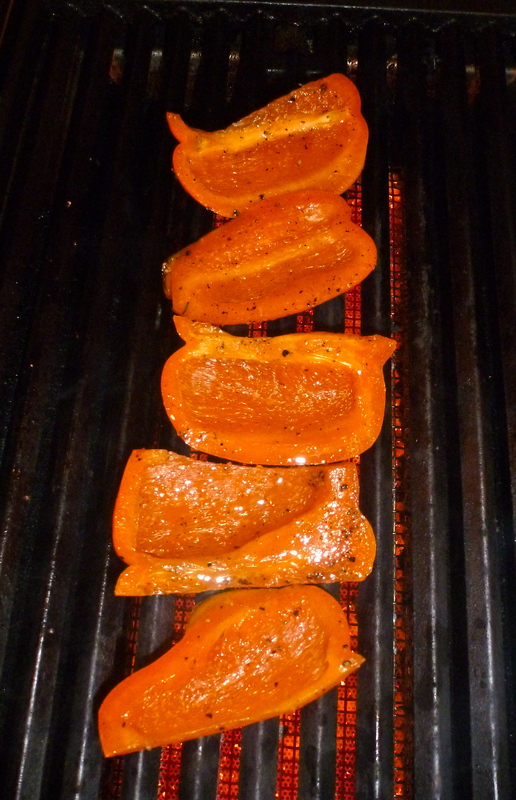 How do you think the griddler compares to a “George Foreman grill” (aka: counter-top electric grill)? I was considering getting one but now I’m not sure! 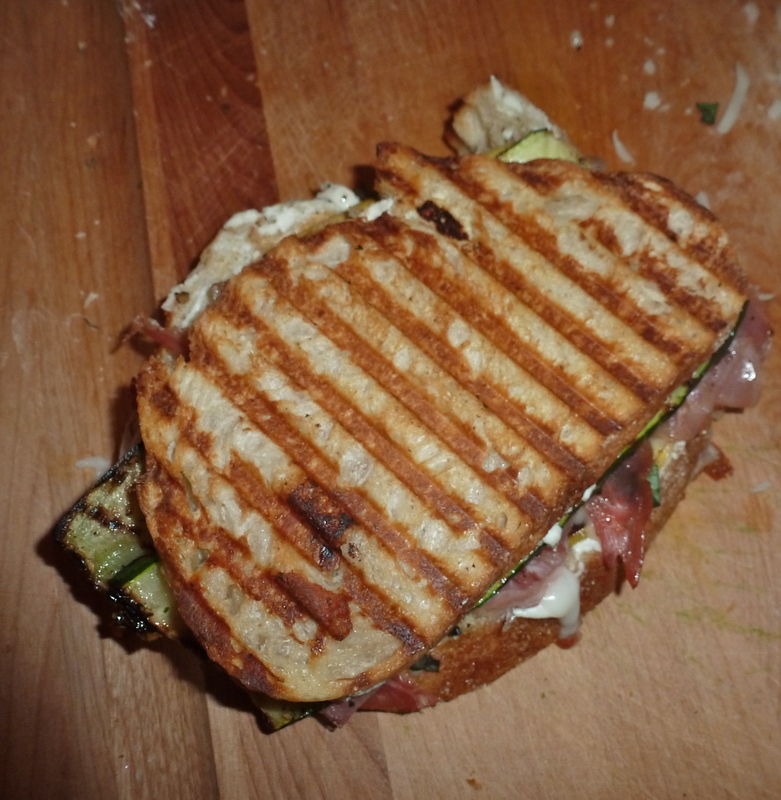 I wrote about another panini I made once, and someone commented on using their Foreman Grill like a panini maker. I think it would work well!